BRIDGES offers a variety of opportunities for college students and recent college graduates to gain valuable experience while making the Memphis community a better place. Opportunities include a variety of part-time professional internships in the fall and spring as well as full time summer opportunities. If you are interested in working with the Bridge Builders program this summer as an AmeriCorps member, click here now. All internships are unpaid (unless otherwise specified) and require an average of 10 hours per week during the school year or 25-30 hours per week during the summer. Selected candidates are strongly encouraged to apply for academic credit through their college or university. Interns must pass a background check and drug screen prior to the start of any internship. HOW TO APPLY: Read about the internship opportunities available and fill out the application below. NOTE: All BRIDGES internships require a high school degree or equivalent. Team BRIDGES Facilitator Intern – APPLY NOW for Spring 2019/Fall 2019 – Serve as a trained facilitator in Team BRIDGES programs. The intern will be responsible for leading and/or co-leading groups of 15-20 adolescent youth or adults through experiential learning activities and discussions focused on values-based approaches to leadership development. The intern will be trained in all equipment used for the position, including facilitation tools, rock climbing equipment and high ropes course safety gear. 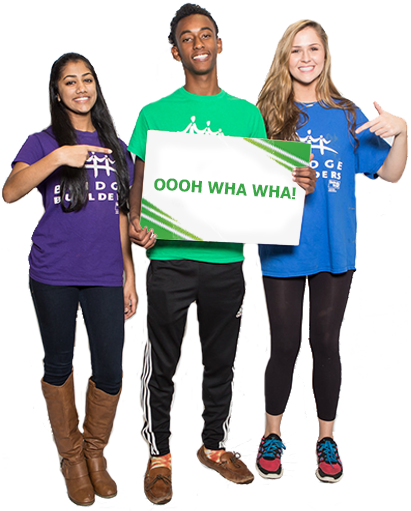 Bridge Builders Event Planning Intern -Assist BRIDGES staff with planning and hosting large-scale events for middle and high school youth from across the Greater Memphis area. Intern responsibilities include recruitment and marketing, coordination and logistics, and designing event programming that promotes youth empowerment and unity. Which semester are you applying for? Will you be completing an internship for school credit? Why are you interested in working at BRIDGES? Please attach your cover letter. Please answer this simple math question below to submit the form. Tell Us Who You Are! EIN 23-7081488 BRIDGES is a 501 (c) 3 organization | 2019 BRIDGES. All Rights Reserved.